In the nineteenth century, the Bog River’s reputation for remoteness attracted numerous writers of the day, who invariably depicted the headwaters as dismal, lonely, and insect-infected. It also was reputed to be the final refuge of the moose in the Adirondacks. “The last moose was killed many times there,” observed Paul Jamieson in Adirondack Canoe Waters: North Flow. 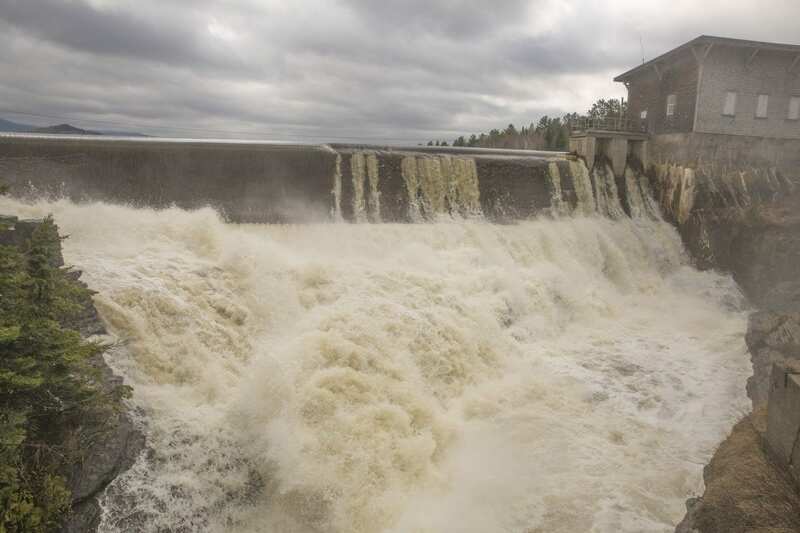 Nowadays you’d be lucky to find a parking spot on a summer weekend at the Bog’s lower dam, the put-in for trips to Hitchins Pond and, farther upriver, Lows Lake. And you’re much more likely to see a flotilla of colorful kayaks than a moose. 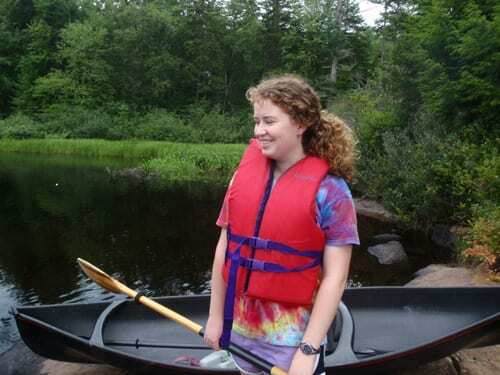 You can’t blame people for wanting to paddle to Hitchins Pond or Lows Lake. 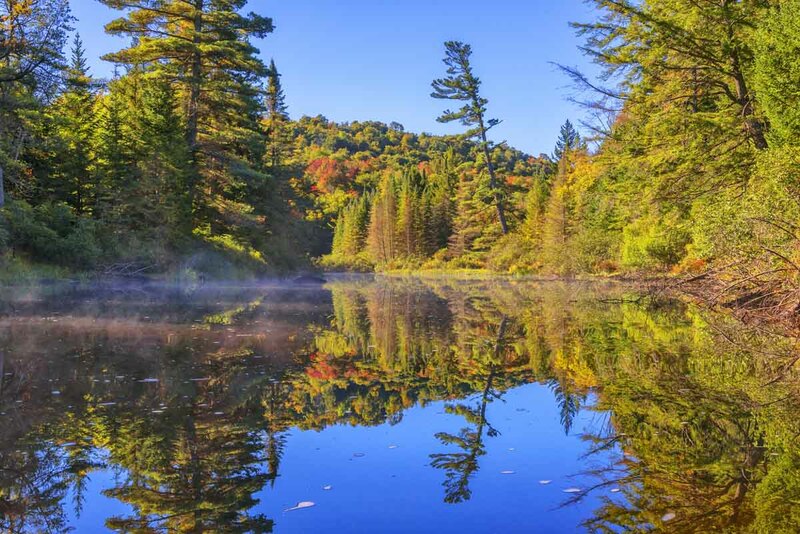 They’re both beautiful waterscapes that offer wild views and the chance to see eagles and loons. But there is another stretch of the Bog that sees only a fraction of the traffic. 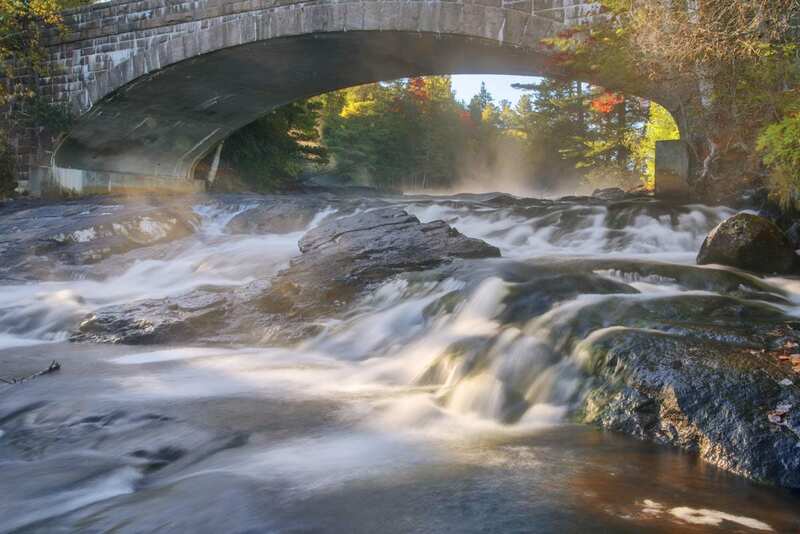 From Bog River Falls, where the river spills noisily into Tupper Lake, you can paddle upstream two miles before encountering rapids. My daughter Martha and I did this trip on a cloudless afternoon in late July and saw no one on the water. We parked in a paved lot next to the falls, reached just after crossing a handsome stone bridge over the Bog. There were a half-dozen other cars, but all the occupants were visiting the falls, not paddling. The falls are identified by the Adirondack Park Agency as a Special Interest Area. You can view them from the bridge or from ledges next to the water. Martha and I did so from both vantage points. A wooded island splits the Bog at the head of the falls. Two streams, on either side of the isle, slide over sloping bedrock and join for a rollicking, frothy ride under the arched bridge before emptying into the lake. All told, the river drops thirty feet in a short span. Paddlers needn’t worry about getting swept over the falls. There is an excellent put-in just a few steps from the parking lot. From the right far corner of the lot (as you pull in), angle toward a still pool. After launching, you paddle up a narrow channel through pickerelweed—a riot of purple in late summer—and enter the river proper well above the falls. There is almost no current here. 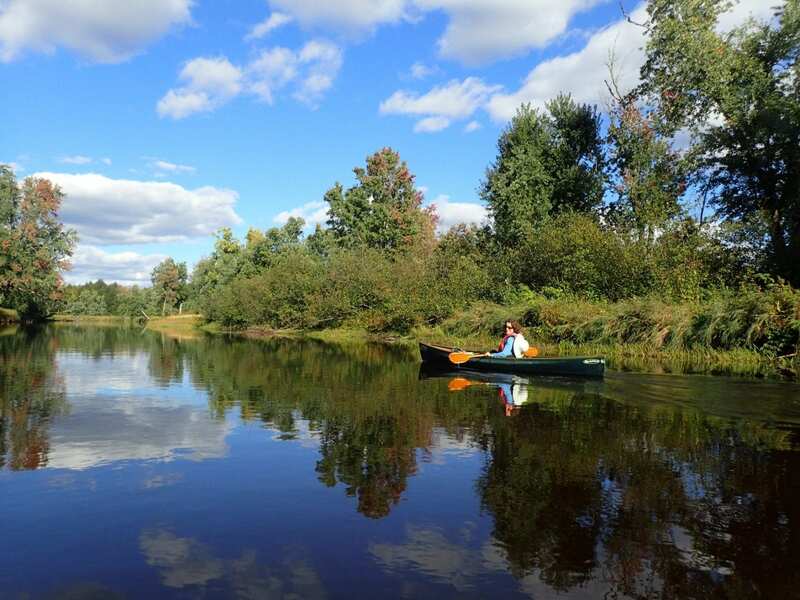 Martha and I paddled upstream in solo canoes without difficulty. The river was roughly sixty feet wide, its shores alternating between marshy and wooded. We passed some stately white pines that evidently escaped the ax. After a half-mile, we saw ahead a large bridge built for logging back in the day. The bridge and the road it served are now closed to motor vehicles. I paddled ahead, exited my canoe at a mucky takeout, and scrambled up a steep bank to snap photos of Martha from above. The views from the bridge—in both directions—disclosed no signs of civilization: the river looked as primeval as it must have appeared to the adventure writers of the nineteenth century. Of course, the bridge itself was a sign of civilization, and alas not the only one. At the start of the trip, we could hear the roar of the falls. As we progressed upriver, this faded but was replaced by a less-welcome noise: cars on Route 30. I suppose this is the price we pay for easy accessibility. But don’t let it deter you. The road is invisible, and the traffic sounds are muffled and diminish as you continue up the river, ever farther from the highway. Shortly after canoeing under the old bridge, I pointed out a boulder in the middle of the river with an iron ring embedded in it. When Martha asked about the ring, I replied, lamely, that it must have had something to do with logging. Not satisfied with that answer, I later called Jim Frenette, a Tupper Lake native who knows the region’s history. He believes workers attached logs to the ring to create a boom, or barrier, to prevent logs from continuing downstream during river drives. He added that logs would be floated from Little Tupper Lake to Round Lake and thence down Round Lake Stream to the Bog. As we pushed on, the river got wilder and quieter. I had told Martha that we’d reach the turnaround in about a mile, but I had underestimated the distance. After a mile and a quarter, I heard the words every parent dreads. “I thought you said it was only a mile,” she accused. At a mile and three quarters, we threaded our way through a collection of large boulders poking out of the water or lurking just beneath. Since the rocks are far apart, this requires no special skill, though you’ll want to guard against scraping your boat. Two miles from our starting point, we came to the confluence of Round Lake Stream and the Bog River—known by locals as “The Forks.” A grassy peninsula divides the two. As you face upstream, the Bog is the river on the right. This was as far as we could paddle, for rapids were visible on both waterways. We took out at a muddy flat spot on the left. A short path led in thirty feet to a good foot trail. This unmarked trail leads in a few miles to Round Lake. Paddlers sometimes use it for portaging as part of a multiday circuit that includes Little Tupper Lake, Lake Lila, Lows Lake, and the Bog. I just wanted to hike it a short distance in hopes of finding a scenic spot for lunch. After ten minutes, though, Martha refused to go any farther. I didn’t think them so bad, but since the paddle had been twice as long as advertised, I didn’t want to push things. We retreated to our canoes and began the leisurely trip back to the falls. As we drifted downstream, I took note of some of the flowers along the way. Among them, besides pickerelweed, were yellow pondweed, cardinal flower (brilliant red), and meadowsweet. It occurred to me that this stretch of the Bog would be especially pleasant in the early morning or late afternoon, especially in fall, with the leaves changing and the summer crowds departed. But if you’re driving past with a canoe on your car, anytime is good. 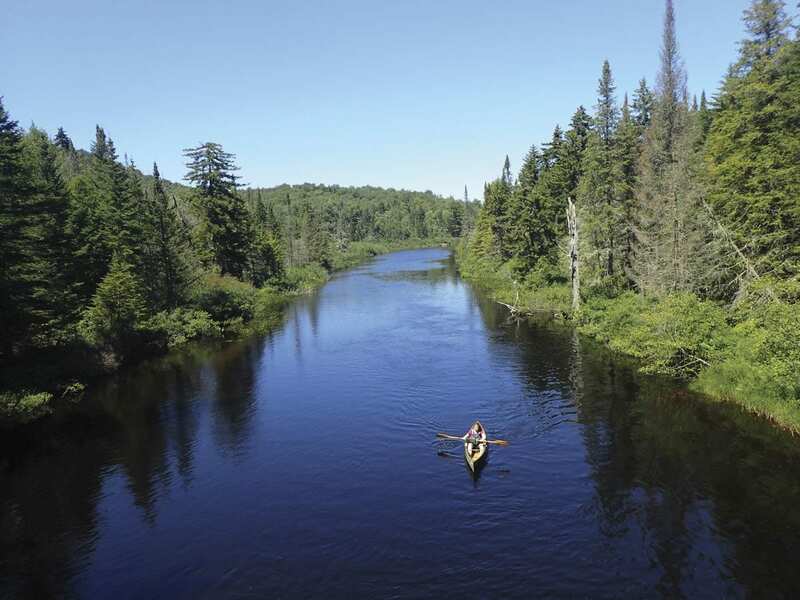 Jim Frenette paddles this stretch of the Bog frequently, whenever he needs a quick immersion in nature. Martha enjoyed it too, despite a few complaints. By the time we got home, she had posted one or two photos on Instagram, the medium of the contemporary adventurer. Paddled my kayak along this stretch of the Bog just 3 days ago. About half way between the falls and the forks, I came upon 3 otters in the river. The traffic noise from rt. 30 is indeed distracting, but once you get away from it, this is a lovely stretch of flat water.